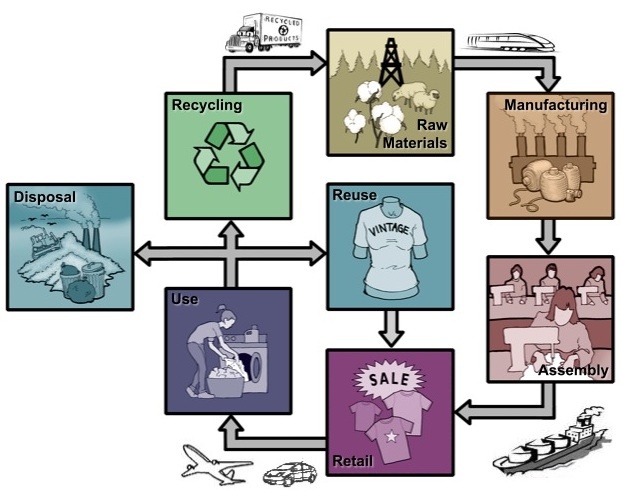 Example of Life Cycle Assessment (LCA) steps for the clothing industry. You’ll hear us refer to “life cycle assessment” a fair bit here at Oroeco (or LCA, for acronym aficionados). So what exactly is it? In its broadest sense, LCA is the detailed accounting of something you care about related to the existence of a selected product or service. Sometimes also called “life cycle analysis” or ecological “footprinting,” LCA is most frequently applied to environmental indicators, particularly embodied energy, toxic pollution, and greenhouse gas emissions. But LCA can also be applied to indicators without direct environmental links, like labor hours or raw material inputs. LCA is essentially just accounting, but where traditional accounting deals with relatively well-documented costs and revenues, LCA typically requires substantial additional data collection to convert process input-output data into the metric(s) you’ve selected. Methodology details matter, sometimes immensely. Just as unaccounted costs and revenue can dramatically alter a corporate balance sheet, what goes into (and gets left out of) any LCA can have profound impacts on LCA results and presumed implications. Why care about LCA? First off, it’s quite hard to improve what you can’t measure. LCA is a powerful tool to get you information about the true impacts from a pair of Levi’s jeans, a carton of Tropicana orange juice, and all sorts of other consumables, impacts that aren’t otherwise apparent. LCA can be great for producers too, because looking closely at a product’s life cycle highlights where energy, water, and other inputs can be saved at each stage of production, either by upgrading to more efficient techniques, or by switching to more sustainable suppliers. These resource savings often also translate to cost savings, which hopefully get passed on to you. These savings, combined with growing consumer scrutiny of the “green labeling” movement, have pushed retail giants like Tesco and Walmart to start requiring LCA data from their suppliers. The pic above illustrates the life cycle of a clothing product. If you’re interested in the life cycle carbon dioxide (CO2) emissions linked with owning a T-shirt, for example, you’d start by calculating all the material and energy inputs (and associated CO2) that go with production of raw materials (e.g. cotton, wool, or oil for synthetic fibers), and then include energy used in manufacturing of intermediate products (like yarn and cloth), clothing assembly, and retail sales. You’d also need to add on all the transportation and packaging energy needed to move stuff between each step. In some LCA calculations, known as “cradle-to-gate” LCA, accounting stops there at the checkout counter. But a complete LCA, known as “cradle-to-grave” or “cradle-to-cradle” LCA, will also include all the energy and material inputs linked to using your T-shirt, as well as what goes into disposal. The results of LCA can be quite informative, and often surprising. For your T-shirt, chances are the use phase of the life cycle will have the largest climate impact, since you wash and dry your shirts many times before they find their way to the landfill (or Goodwill), with each load of laundry requiring a substantial amount of electricity and/or natural gas (as well as embodied energy in laundry detergent, fabric softener, dryer sheets, etc. ), though you can reduce your use phase impacts by washing with cold water and hanging your clothes to dry. If you care more about toxics than CO2, it’s the pesticide-laden production of cotton that looks particularly incriminating, though that can also be avoided by buying organic.